"I speak to thee, my heart!" Just in time to ring in the chimes at Midnight as New Years 2016 rolls in. 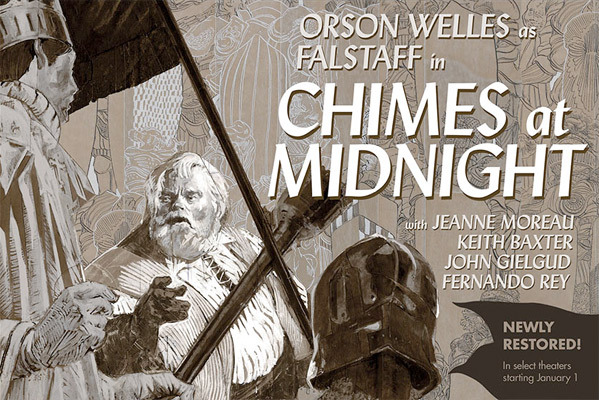 Janus Films has debuted another slightly different trailer for Orson Welles' 1965 classic Chimes at Midnight, also known as Falstaff Chimes of Midnight. Earlier in 2015, we featured the trailer for the 50th anniversary re-release in the UK, and now we have a US version. Chimes of Midnight is really Welles adaptation of his play Five Kings which was an attempt to combine Shakespeare's works Henry IV, V, VI and Richard III into a single play, reportedly "Welles' favorite of his films." The result is a work that is heralded as a masterpiece, featuring performances by Orson Welles, Keith Baxter, John Gielgud and Jeanne Moreau. Chime in below. The crowning achievement of Orson Welles’s later film career, Chimes at Midnight returns to the screen after being unavailable for decades. This brilliantly crafted Shakespeare adaptation was the culmination of Welles’s lifelong obsession with the Bard's ultimate rapscallion, Sir John Falstaff, the loyal, often soused childhood friend to King Henry IV's wayward son Prince Hal. Appearing in several plays as a comic supporting figure, Falstaff is here the main event: a robustly funny and ultimately tragic screen antihero played by Welles with towering, lumbering grace. Integrating elements from both Henry IV plays as well as Richard II, Henry V, and The Merry Wives of Windsor, Welles created an unorthodox Shakespeare film that is also a gritty period piece, which he called "a lament … for the death of Merrie England." Poetic, philosophical, and visceral—with a kinetic centerpiece battle sequence as impressive as anything Welles ever directed—Chimes at Midnight is as monumental as the figure at its center. Janus Films will re-release Chimes at Midnight in select theaters starting January 1st, 2016 to ring in the New Year. Don't miss out. This was a truly beautiful piece of cinema. A Shakespeare remix by Welles. Fallstaff was a miserable drunken boaster who talked rubbish endlessly... in today's world he would be a social media giant and presidential contender. Woah. This is too good. Not for the faint hearted.